A matter to consider is the two deities. The section of the Kojiki historical records detailing the offspring born during the development of kami from heavenly to earthly deities , gives mention of both under the 'sea kami' category. This would be fitting bearing in mind the Morokui location. A fascinating idea is that that back in the early Edo era, the two kami were chosen after a reading of the Kojiki and consideration of local area culture. There is a possibility that the 'Kui' part of the Morokui place name was taken from the names of the kami Amenokuhishamochi-no-kami and Kuniokuhishamochi-no-kami. Shamochi can be seen in two separate documents written with different characters. Regarding the reading, putting the pronunciation 'Shamochi' aside, leave the option of 'shamoji'-more likely readable to people confused by the characters used to write 'shamochi'. Within this context, shamoji (which is also the word for a wooden ladle/scoop) derives from the old use of a gourd to draw water, suggesting there was a time when Shamochi was related to the kami of water and irrigation. While there are a significant number of paddy fields in Hokuda, personally speaking, the likelihood is higher of a connection to the ocean and the mythological sea creatures like 'Saihimochi', alligator and shark deities, or as depicted in the Fudoki, the 'wani' sea shark as depicted in the Fudoki. Around 1560, during Oda Nobunaga's Battle of Okehazama, three of the vassals of his subordinate, Mori Yoshikatsu, died in battle on an island off Houda sea close to Shichirui harbor.Following this, an epidemic took hold and believing it to be a curse of the three warriors, residents, shrines and temples were subsequently relocated to Houda. 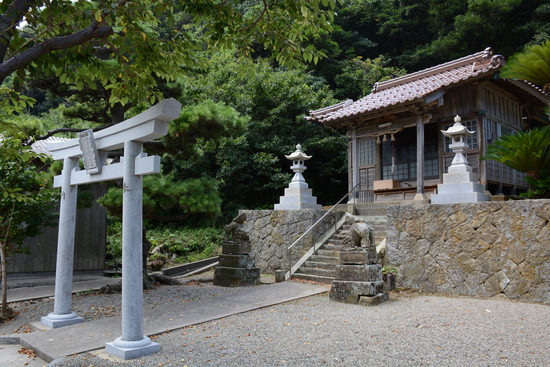 The shrine dedicated to the spirit of the vassals was enshrined within the precincts of Shamochi shrine in 1685. The manga artist Mizuki Shigeru who was raised in Sakaiminato city, located just after crossing the bridge from the south side of Shimane Prefecture in Morogui, visited Morogui during his childhood. It is said to have been an influence on the world of youkai (ghostly figures) he created in his cartoon, Nonnonba. Morogui is also the hometown of Mizuki's childhood nurse, Kageyama Fusa. A bronze statue of the young Mizuki Shigeru and Kageyama entitled Nonnonba' and 'Me, was unveiled in April 2013 at Ichibatayakushi temple, a place Kageyama held in the highest reverence. In attendance on this day among others were Mizuki Shigeru and his wife and daughter, the governor of Shimane, and the mayors of Matsue, Izumo and Sakaiminato. The unveiling was an auspicious occasion with events including the chief priest of Ichibatayakushi offering up special prayers for those that have passed. 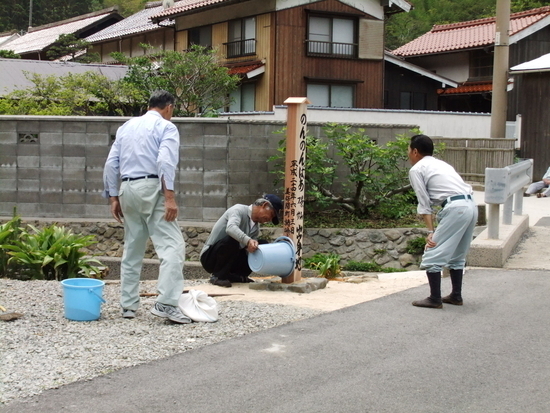 Near the bridge on the way to Shamochi shrine is a wooden commemorative pillar placed at the hometown of Kageyama Fusa courtesy of the local neighborhood council. In addition, there are signboards for 'NonNonMura' (village) and 'NonNonbaa Densetsu' (legend) thanks to the mutual co-operation between the Morokui District and the International Cultural Department of the Matsue City Municipal Girls' High School. This area is a point of contact between the world of the Shimane Peninsula 42 Bay Pilgrimage and that of Mizuki Shigeru's yokai. 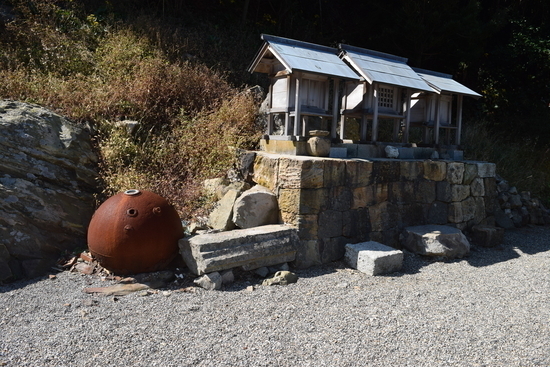 Near the Koujin (Cooking Kami (deity)) shrine location to the right of Shamochi shrine, is a round red metal rusted object. This is a sea mine laid in the Sea of Japan as a defense measure for the country during the Pacific War. It has said to have exploded after the war off Sozu Bay killing 16 youngsters.